Friday, July 8th from 8pm – 10pmJoin us this Friday to celebrate the release of Tom Neely’s beautiful new painted novel, “The Wolf”! The Wolf is a new graphic novel by Los Angeles-based painter-cartoonist Tom Neely. The book tells a simple love story, but one woven with surrealist horror, werewolf lore and its own brand of nightmare logic. With The Wolf, Neely progresses from the traditional cartooning style he showed off in his previous books, The Blot and Brilliantly Ham-Fisted, to a form that blends comics-style storytelling with a fine arts approach to imagery. The ultimate effect is equal parts touching and chilling. Check out a preview for Part One of the book here! 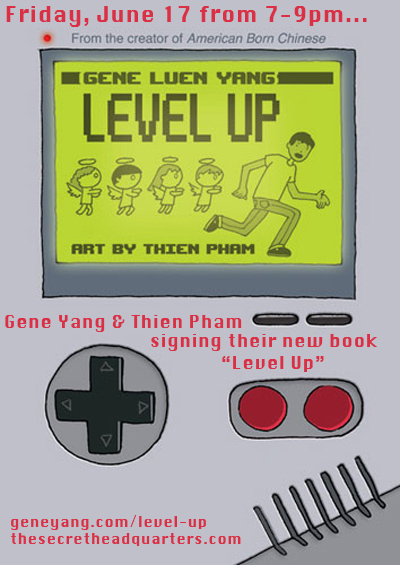 Join us in celebrating the release of “American Born Chinese” writer Gene Yang and artist Thien Pham’s new graphic novel, “Level Up”. Stop by this Friday to have a drink and get your book signed! “Smackdown! Video Games vs. Medical School! Which will win the battle for our hero’s attention in Gene Luen Yang’s new graphic novel? Dennis Ouyang lives in the shadow of his parents’ high expectations. They want him to go to med school and become a doctor. Dennis just wants to play video games—and he might actually be good enough to do it professionally. But four adorable, bossy, and occasionally terrifying angels arrive just in time to lead Dennis back onto the straight and narrow: the path to gastroenterology. It’s all part of the plan, they tell him. But is it? Read an excerpt of the new book here. See you on Friday! 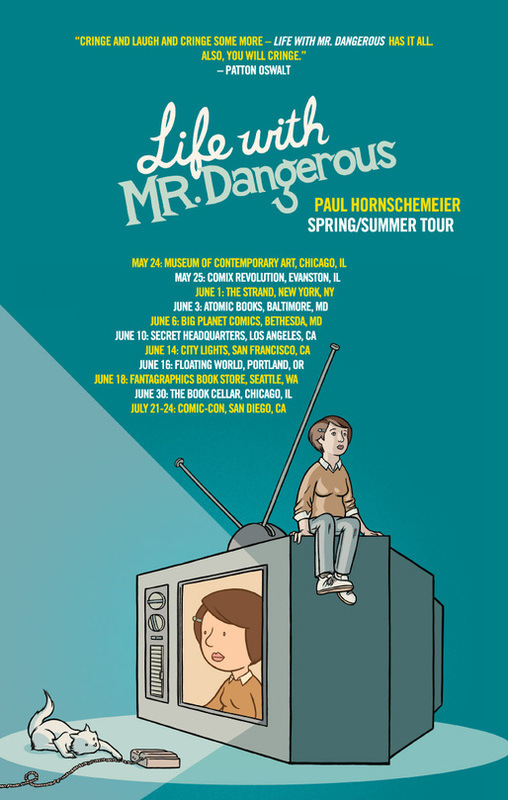 Come celebrate the release of Paul Hornschemeier’s new book, “Life with Mr. Dangerous”! Join Paul and the SHQ gang for drinks, book signing, and good times. It’ll be Paul’s only Southern California stop until Comic-con, so don’t miss it! “Empathy and creativity inform this unsentimentalized account of a young woman’s loneliness. Check out the trailer for the new book here! Holly Conrad wishes she had a space ship and a mage tower. She can’t have those, so instead she spends her time making monsters and playing video games. You may have seen her creatures and costumes on the floor at Comic-con, and now you can check out her creations right here at Secret Headquarters! Wooo! Come as a monster and get a prize!!! No kidding. Monsters will be on display for a limited time. See them sooner then later. Prints were produced in a signed and numbered run of 3 per image. Prints are available framed for $40 each. Do not be foolish punks, grab them while you can!